SASecure are the number one choice in providing knowledgeable advice and effective loss prevention solutions for the protection of products within gym’s and spas such as towels and robes, with our solutions extending into hotel shopping malls and many adjoining golf club shops. We supply discreet sew in tags for towels and robes that provide effective security when coupled with our wide choice of ‘next-generation’ securing systems supplied at affordable prices. 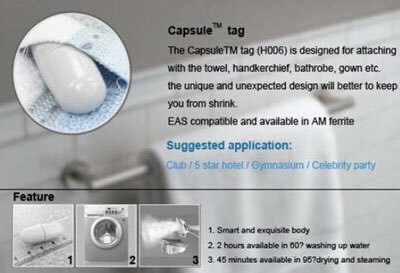 The tags are designed to withstand the everyday commercial washing, drying and ironing cycles of busy hotels and spas. Discreet sew-in tags specially designed for the protection of towels, robes and washable items found within gyms, hotels and spa’s. Adhesive labels for the security of boxed items. Special insertable labels cleverly designed for cellophane wrapped products such as beauty creams and cosmetics. An huge variety of tags for securing clothing items, handbags etc. The full range of products needed to secure items within an adjoining golf shop. Designed to be sewn into a towel, for use in gyms and hotels. Will withstand the washing and ironing process. Can be put through the wash cycle withstanding 2hrs at 60 degrees and 95 degrees on a drying cycle.